Carvings are typically produced by removing layers, sometimes very thin, other times deeper and larger, from the surface of rock. Depending on the nature of the rock medium and its “skin,” the motifs created by incision or in relatively pronounced relief will contrast more or less with the surrounding rock surface through their hue or form. To achieve this, artists use tools that are usually made from a material harder than the rock to carve. For instance, on a soft rock outcrop, such as steatite, or “soapstone,” it would be easy to use a stone, bone or antler tool, or even a wooden or metal tool (e.g., knife blade) to mark the surface with signs or symbols. Carvings, or petroglyphs, are created by incision, pecking or abrasion. More precisely, an artist need only run a sharp tool straight along a specific line to create an incised motif. For deeper carved motifs, other techniques and types of tools are required: typically, a hammerstone to remove a piece of the surface by pecking or pounding (direct percussion), a chisel struck using another tool to remove a fragment of the surface (indirect percussion) or a sharp tool on which strong pressure is applied to carve the rock surface. The techniques used to produce images or paintings involve colouring material added to the surface of the rock. In most cases, colouring materials are composed of mineral pigments (for instance, hematite for red motifs, limonite for yellow and kaolin for white). Sometimes, plants sources are also used for colouring materials (such as charcoal for black and lichen for yellow). In certain cases, an animal-sourced bonding agent is used (isinglass, animal fat or blood) to ensure greater adherence of the pigment to rock surfaces. The basic instrument used to apply colouring materials has always been the finger, sometimes the hand (to smear a surface, for example). However, some paintings were created using more or less sophisticated tools like feathers, twigs or small sticks, or crayons (for example, pieces of unground ochre), but also paintbrushes. Red was a widely used colour across Canada and North America, but black, yellow, white and blue are also occasionally found on sites. Red ochre, which contains hematite, is known as a powerful and sacred substance the colour of which symbolizes life. This colouring material is also used in various rituals, including healing ceremonies and even as a hunting charm. 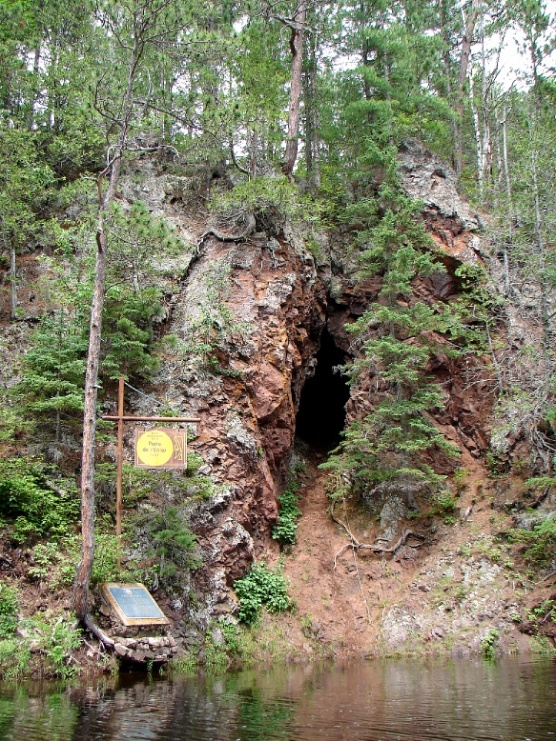 Although pictographs and petroglyphs are two different kinds of images, both are sometimes combined at rock art sites; for instance, in British Columbia and at Áísínai’pi, where certain petroglyphs were highlighted using paint. 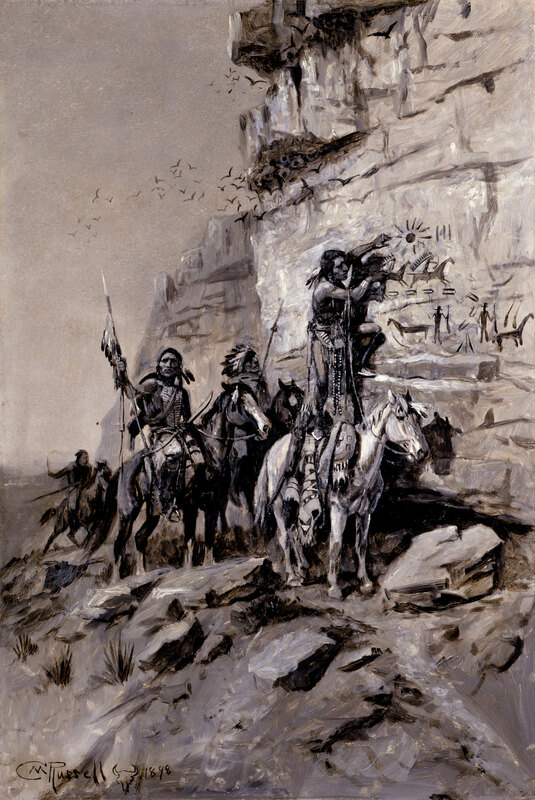 Artwork by Charles Marion Russel representing a group of men on horseback near a cliff, in Alberta, Canada. One of them is painting on the rock.